Sangria has suffered from a bum rap for far too long. This light and refreshing Spanish sipper has been ruined so many times by too much alcohol and an overload of sugar that most wine lovers won’t give it a second thought. Yet, when simply made with a young and fruity red wine, a little citrus and sparkling water to cut the alcohol, a glass of sangria is the ideal drink for a lazy Sunday afternoon with friends. True, it’s not a serious wine, but who wants to be serious all the time. It’s just the thing to go with a bowl of olives or burgers just off the grill. Most recipes I’ve encountered go wrong with an endless list of ingredients. More often than not, there’s brandy, perhaps some Cointreau or even gin, all manner of cut-up fruit – from apples and pears to strawberries and pomegranates – plus fruit juice and a generous portion of sugar. It tastes like juice box punch with a kick. I knew I had found a recipe for my taste when I stumbled upon this one in “My Nepenthe: Bohemian Tales of Food, Family and Big Sur,” by Romney Steele (Andrews McMeel, 2009). It’s simple to make and easy to drink with bright citrus flavors playing counterpoint to the wine. Fruity, inexpensive red wine is what you want for this recipe. It should be something you would enjoy drinking on its own but not too complex or tannic. I use my favorite Big House Red, a box wine long on character and short on subtlety, as well as a fresh French rosÃ© bottled under the La Ferme Julien label and sold at Trader Joe’s. Mix it up, let the flavors meld in the fridge for at least three hours – overnight is better – and serve over ice with a big splash of soda. ¡Salud! Cut orange in half through the stem and blossom ends, then slice half moons about ¼ -inch thick. Slice lemon and lime in ¼ -inch rounds. Place fruit in large pitcher, add sugar and stir until dissolved. Add wine, stir, cover and refrigerate for at least three hours – preferably overnight. 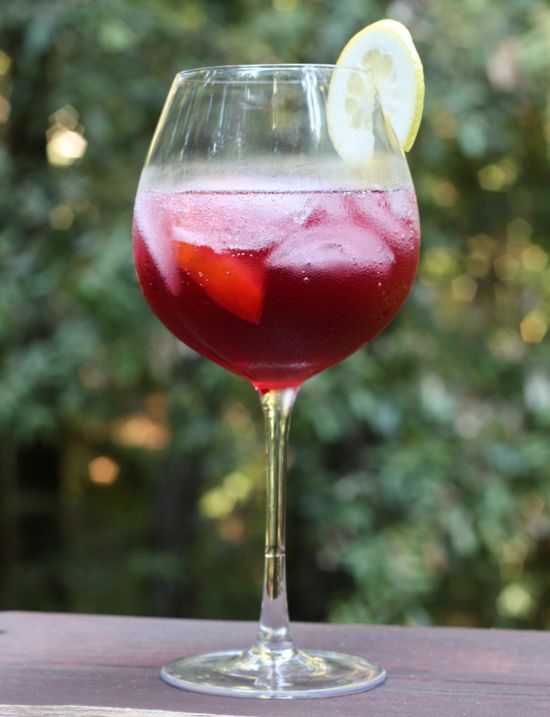 To serve, pour wine and a few slices of fruit over ice in wine glasses, filling about halfway. Top off with club soda to taste. Note: If the wine is very dry or tannic, you may want to add a tad more sugar. You’re right. I got absolutely tanked off sangria once and haven’t touched it since. In saying that though, I’ve never seen it done the way you’ve just done here on this site. I’m going to take this recipe, and give it a second go. I don’t think I’ll be going as hard as last time I was on the sangria. However you’re right, if done in moderation this recipe that is put up I’m sure is very refreshing for a light afternoon session with friends. Thanks for giving me some faith back with this drink. I want to raise those horrid memories of the day after last time.